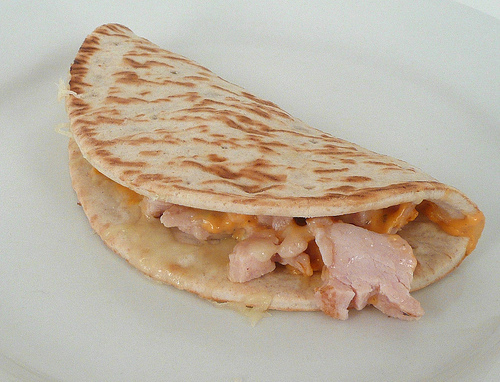 This post is filed under Cheese, Chicken, Flatbread, Microwave, Ranch, Refrigerated. I think that one has to take these things for what they are. You can’t expect much from food that is packaged and processed for longevity. The chicken and bread can’t be like fresh considering that they are to last a bit longer than the real deal. For what it is, this doesn’t really look too bad. If you were in a pinch, you could do worse, but I’m guessing the fat content is a bit high (as well as the sodium) because of the cheese and dressing. Unless this is a big sandwich, 510 calories seems a bit excessive for all the more there is to it. What the heck do they mean by “Buffalo-style” ranch dressing if it’s just plain ol’ ranch? Is the sauce depicted in the real-life pix? Bill: It’s in there, but almost impossible to distinguish from the cheese. WTH?? That looks awful. It looks like bland poached chicken with some oil based sauce, that is either bland or chemically. 510 calories just very slightly less then a Big Mac, so it does seem high for such a sandwich. I’m Middle-Eastern, and I must tell you, no one eats flatbread like that. Remember when this used to be a real website. JJ and nm: Regular posting will resume soon enough; life got pretty busy outside of this site. A couple of you are confused. This is 310 calories not 510. Am I the only one who initially misread “Deli Creations” as “Desecrations”? Got a bunch of these today at the 99 cents store today. 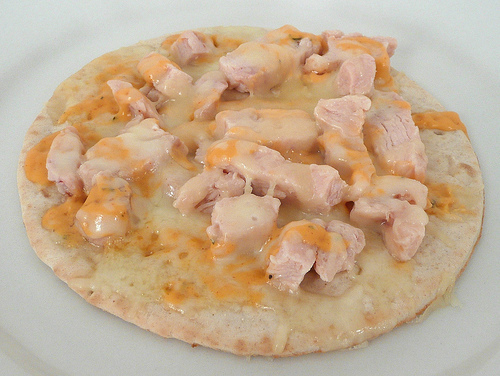 Who cares if it’s not how Middle Easter people eat flatbread? It takes 40 seconds in the microwave and tastes very good. It’s 310 calories, not 510. Learn to read. Can’t go wrong with lunch for 99 cents. Oh, and the dressing was pretty spicy. 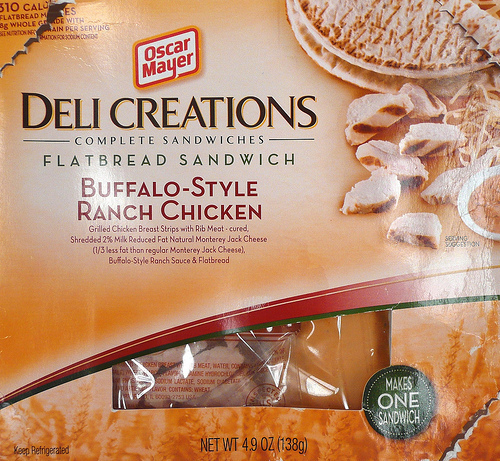 Definitely Buffalo ranch, not regular ranch.